More than 1,000 California Republicans flocked to Anaheim this weekend, confronting the best of times and the worst. In Washington, their control of Congress and the White House has given them unchecked power to implement a conservative vision for the country. Here in California, however, the party is lost in the political wilderness -- with a declining share of voters and completely shut out of statewide offices. 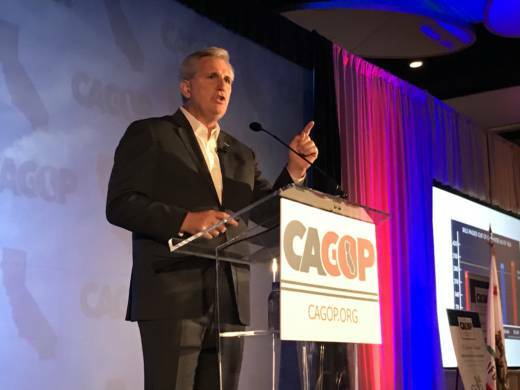 After mingling among the Republican candidates, delegates, activists and volunteers this weekend at the party's convention at the Marriott Hotel, here are five takeaways on the state of the California GOP. Democrats have two-thirds supermajorities in the Assembly and Senate. The last time Republicans won a statewide election in California was 2006. And some time in the next year or so, the number of voters registered with "no party preference" will surpass the number of registered Republicans. But GOP leaders think the Democrats' numerical superiority has led them to overreach. Citing the recent gas tax increase and SB 54, the so-called sanctuary state bill signed by Gov. Jerry Brown, Republican Party Chair Jim Brulte said, "Our job is to remind voters that Democrats broke it, they own it and we can fix it." 2. Ronald Reagan's 11th Commandment -- "Thou shalt not speak ill of another Republican" -- is definitely dead. 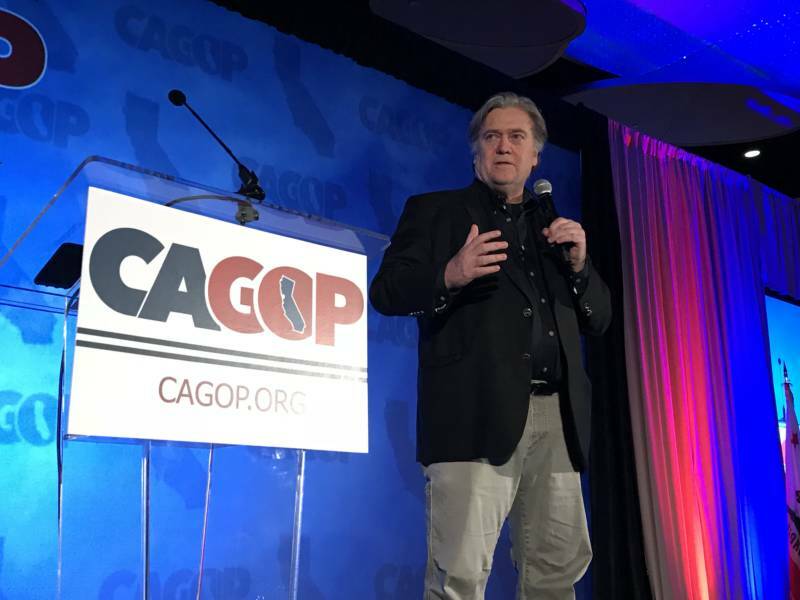 When the California GOP announced that former Breitbart News editor and White House adviser Steve Bannon was speaking at the convention, some moderate Republicans were horrified. But dinner ticket sales doubled. That crowd booed when Bannon first mentioned Sen. John McCain and former President George W. Bush. Loudly. "He has no idea if he’s coming or going," Bannon said of Bush, "just like when he was president." For good measure Bannon added, "There has not been a more destructive presidency than George W. Bush's." Astonishing. 3. Silicon Valley, fasten your seat belts. You might be in for a bumpy ride. Republicans like House Majority Leader Kevin McCarthy and House Speaker Paul Ryan make regular pilgrimages to Silicon Valley. GOP leaders have worked hard to understand the issues important to the tech industry. But there are signs the Trump administration has tech in its crosshairs. On Friday night, Steve Bannon derisively described the "lords of technology in Silicon Valley" as part of the "ascendant economy" along with Hollywood, Wall Street and Washington, D.C., elites that "made out great" while others "got screwed." He criticized tech companies as wanting the benefit of trade agreements and H-1B visa policies while leaving trillions of dollars offshore, avoiding corporate taxes. He also said that if California does not repeal SB 54, the so-called sanctuary state law, "10 to 15 years from now, the folks in Silicon Valley and the leftist progressives are going to try and secede from the Union." After revelations about the role that Facebook, Google and Twitter played in enabling Russian interference in the November election, Democrats also seem ready to reign in Silicon Valley. It all makes the Nov. 1 hearing of the Senate Intelligence Committee, where executives from those companies will testify, very interesting. 4. Republicans are placing a lot of eggs in their "repeal the gas tax" basket. Next month, the gas tax in California goes up 12 cents per gallon and 20 cents on diesel fuel. Republicans love a good tax revolt and for good reason. It often works. When freshman Sen. Josh Newman (D-Fullerton) voted for SB 1 to raise the gas tax, Republicans quickly launched a recall campaign against him. 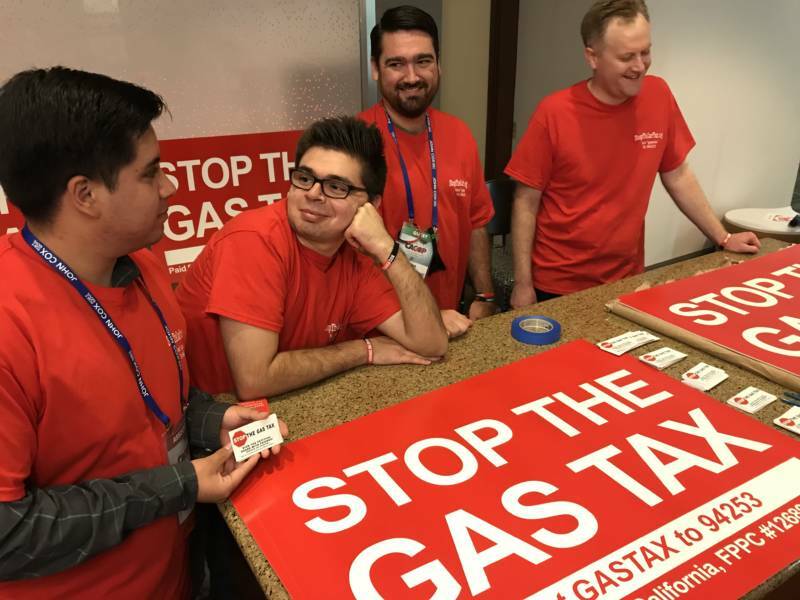 Now the two GOP candidates for governor, John Cox and Travis Allen, are promoting competing ballot measures to repeal the gas tax. As Bannon said, "The left has overplayed their hand." He told the GOP crowd that, "Everything you need to win, you have." The question is, will drivers notice the increase and how much will they care? 5. Among political activists, no cause is too obscure to rally around. Among the booths lining the hallways of the Republican convention was one urging people to sign a petition to recall Gov. Jerry Brown. Never mind that Brown is termed out and will leave office in January 2019. A recall measure on the November 2018 ballot is apparently just the thing. And why not? With 43 initiatives and referenda in some form of play, what's one more?